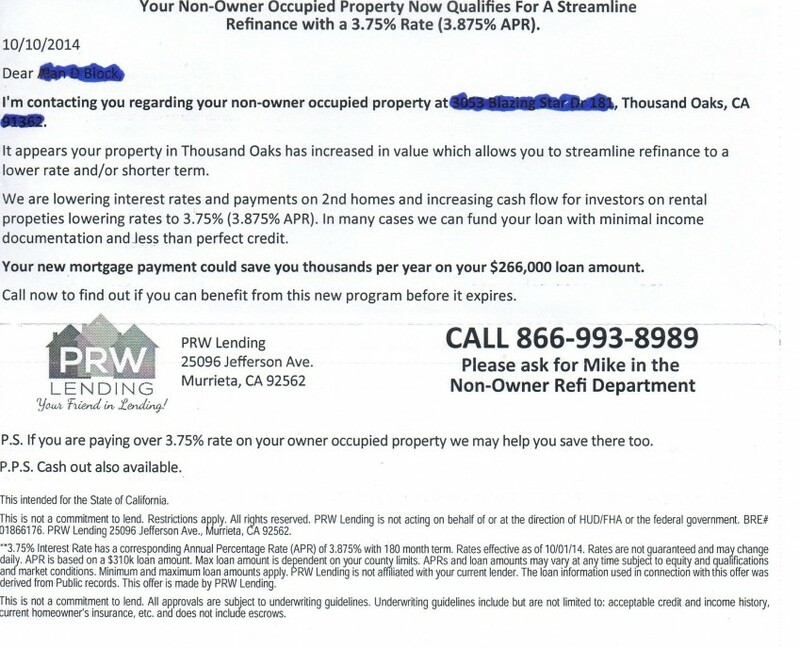 We recently received a copy of a mailer ad that offers to refinance our investment property first mortgage loan of $266,000 into a loan with a 3.75% rate. The mailer used real property public records to find our information including our original loan amount on the property. Everything looked pretty good in the disclosures here. One comment – the loan amount referenced of record is $266,000 but the APR used is based on a 310K loan amount so that was strange and potentially confusing for consumers. **3.75% interest rate has a corresponding Annual Percentage Rate (APR) of 3.875% with 180 month term. Rates effective 10/01/14. APR is based on a 310k loan amount. Max loan amount is dependent on your county limits. APRs and loan amount may vary and at any time subject to equity and qualifications and market conditions. Minimum and Maximums loan amounts may apply. PRW Lending is not affiliated with your current lender. The loan information used in connection with this offer was derived from Public records. This offer is made by PRW Lending. One important licensing disclosure is missing. Did you catch that?